sweet spot and decreased vibration, resulting in better stroke accuracy. 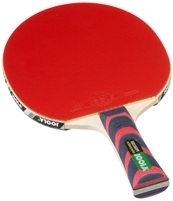 The Rosskopf Classic is one of the highest quality table tennis rackets available! This competition-level racket uses inverted rubber with a sticky topsheet and lively sponge for a combination of unparalleled control and power. The Classic is great for players who can play all basic strokes and successfully apply strategy to their game. 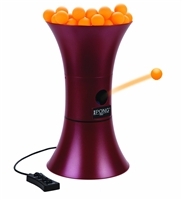 Includes 2 paddles, 2 balls, and table tennis net. This table features a steel frame with black powder-coated finish and a 3/8-inch-thick laminated playing surface in a blue table top. Its folding design with velcro lock and carry handle makes it easy to store or take with you too. 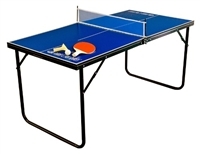 Enjoy quality time with family and friends with this easy-to-assemble and user-friendly table tennis table from Stiga. The heavy-duty table features a 5/8-inch black edge-banded surface with corner protection pads to prevent snags, 1-½-inch round steel tube legs for stability and silk-screened striping. 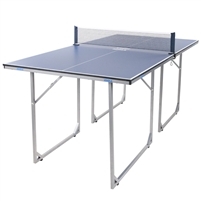 The extra-heavy duty steel chassis with support panels provide stability in play, while the 1-1/2 -inch steel apron and cross brace add both extra table support and consistent bounce. Three-inch mag wheel casters offer easy mobility, while the two with locking brakes keep the table in place. Net and posts are included. The new Stiga Tournament Series (STS) Tables provide quality, durability, performance, innovation, and convenience. The STS 185 table includes a .75-Inch Top that is sanded and UV filled prior to multiple coats of specially formulated paint and finished with a clear top coat for a smooth, durable, consistent playing surface.